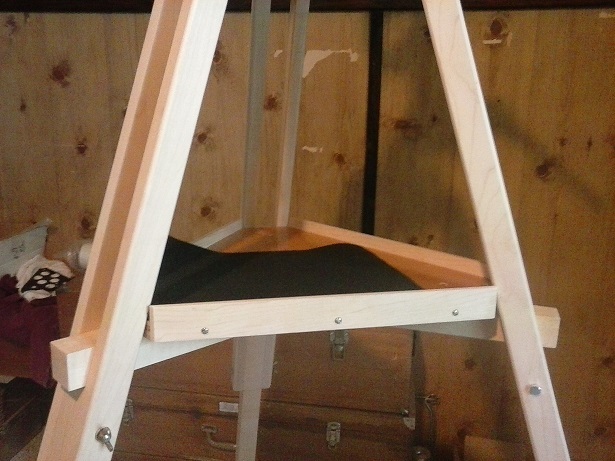 Making a wooden tripod for my classic telescopes. black paint was a bad idea? Okay how so? Would you recommend a dark stain in the alternative? I Love the solid legs. Anyway I like what you did there and I think even I could make a one piece tripod leg. But I am pretty clumsy and actually I am afraid of electric saws. The only saw I am not afraid of is the saws all because I have to both hands on it when it is running. I am good with a sander but not cutting tools. " A man s got to know his limitation"
My 88 year old dad is a great wood worker though and he has all the tools etc. Is that something you carpenter gurus do on a table saw or the ripper thing or a ban saw ? The black looks great. Perhaps a black stain instead? Or does it just show scuffs etc. too much? What kind of 2x4s? Something like knot free Douglas Fir? The black paint was a problem two ways..... it was sort of a matt finish, so it showed every scuff and dirt-smudge, and being black, was really hard to see in the dark, and I kept kicking it, but something white at the bottom of each leg, or some tiny lights, would have cured that. I have since used clear finishes on my tripods. 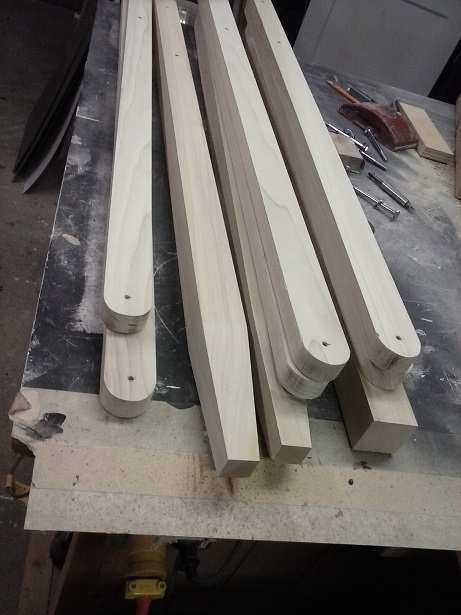 To make the legs, I selected some pretty much straight and knot-free pieces of 2x4, which around here is spruce (but fir would certainly work) and the tools I used were a drill press and a table saw. I drilled a 1 3/8" hole near the top end (1 3/8 is 35mm, the size of the mount hub blocks) and a 3/8" hole sideways for the bolt, and then sliced out the slot leading from the end of the wood to the hole, then used a taper-jig on the table saw to taper the legs, but that part is just for pretty, not needed for the tripod to work. The tray was a piece of plywood, with angle-brackets re-bent to the right angle, and screwed to the plywood, and held to the legs with bolts and wing-nuts. The stability difference between this and the aluminium tripod that came with the scope was amazing! Similar to what I had done to my Mayflower 816 mount about 5 years ago. I made the tray and its supports out of oak, and it turned a mediocre mount into a rock solid one. Plus, it gave me a much nicer tray! Even added a Mayflower label. 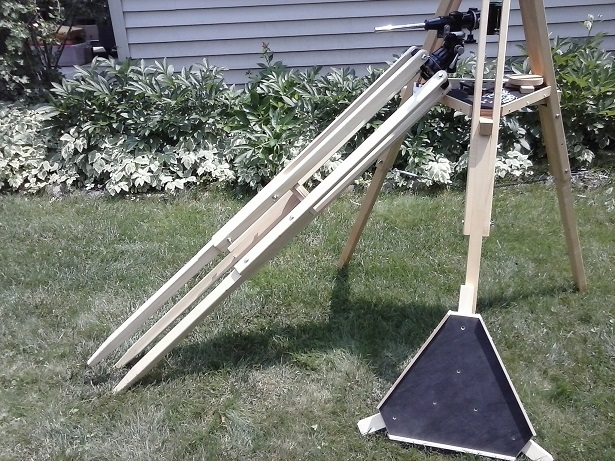 From a previous post, I mentioned that I'm making another one of these wooden tripods. The first one in this thread was made out of Maple. This next one is being made out of Poplar. Next I will be sanding and rounding the edges with a router. I liked what Chuck suggested, to wipe the polyurethane on the wood. That worked out great on the Maple tripod. Edited by Garyth64, 27 June 2018 - 07:26 PM. I think the black paint looks great on this setup. Everything is fitting nicely. The tray is almost done, too. Should be ready for Saturday's Beginner's Night at Island Lake. 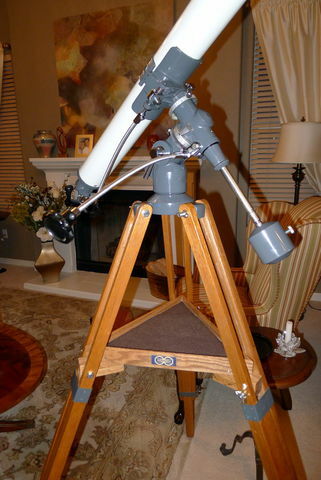 I must make one now for my ATCO... the original is warped and in bad shape. Not sure what wood yet, was thinking White Ash, but I just got a lead on some Honduras Mahogany boards, nice a dry and stable. Thanks for the inspiration!! Edited by shooze, 28 June 2018 - 01:16 PM. I've been watching this thread with great interest. Very nice tripods you are making, Gary! 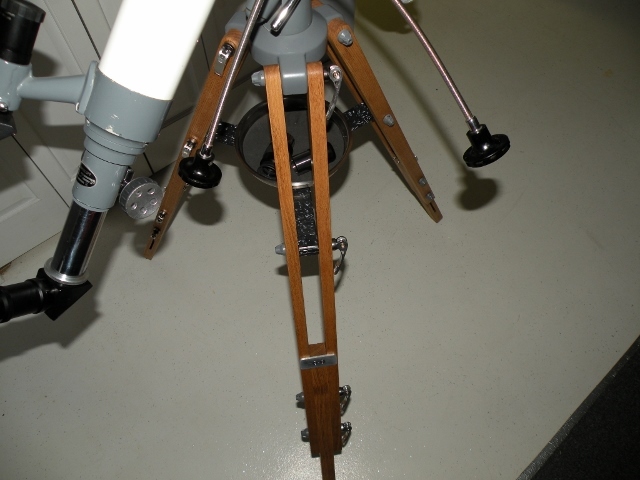 I've made a number of wood tripods to replace the shakier or less functional ones on some classics I've owned. 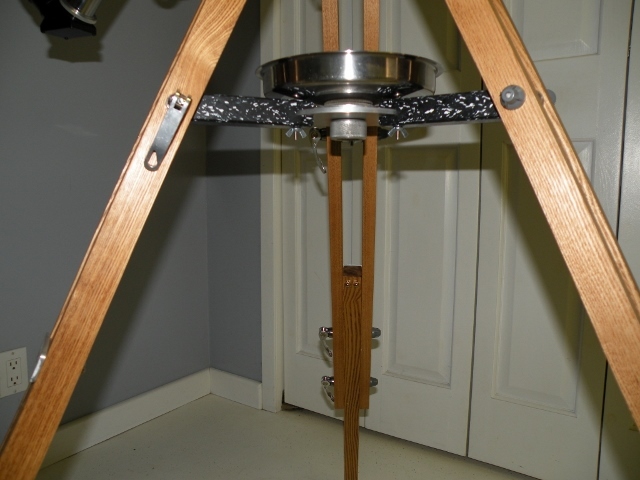 Here's an oak tripod that I have decided to use with my newly acquired Unitron 114. The original tripod lacks a spreader and the spike tips aren't always my cup of tea. 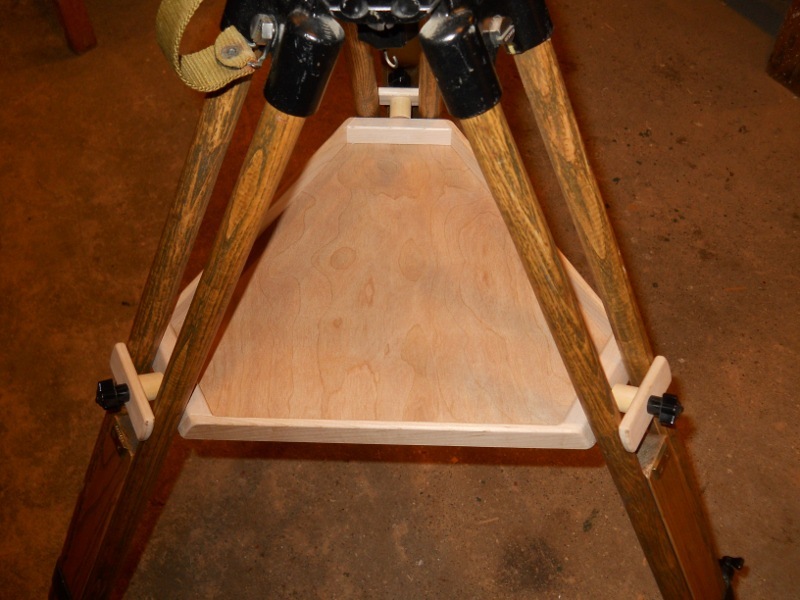 The home-made tripod is designed similar to the original, with a folding design. It is non-adjustable in height and uses a chain for a spreader. I decided to go with chain because it fit better with the grab and go function of this telescope. I can simply lift the telescope, collapse the legs with the chain attached, then be out the door in one trip. Rather than spikes, I opted for crutch tips on the ends of the legs. A few minutes on my wood lathe and I was able to taper the ends of the legs and provide a recessed cylindrical adapter for the crutch tip. I went with a simple oiled finish. Works great and just as sturdy as the original! Edited by ScottAstroNut, 28 June 2018 - 04:00 PM. That Ash is going to be hard to work with. Unless you don't mind working with hard woods. That's why I went with Poplar this time. (I ran out of Maple.) The Maple was tough to sand out any saw blade marks. I had thought of using pine, but it's too soft. Aspen may be ok, but I've worked with Poplar before. Now that's almost done, I think the Poplar was a good choice. It's not soft like pine and easily sandable. Mahogany wood be very nice. I like the tripod that is on the 4" Unitrons, and had thought of doing that. But those are one piece, and cannot be broken down into smaller sections. I was also influenced by the Unitron tripod tray. The Unitron tray, and my adaptation of it, keeps the legs from any twisting, and has a large area to put stuff. Edited by Garyth64, 28 June 2018 - 04:05 PM. That is very nice! I love the look of Oak. I like what you are doing, but have a aesthetic suggestion. 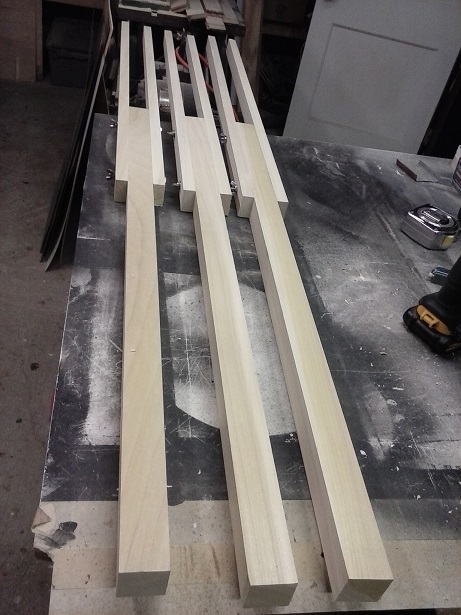 Have you thought about cutting the ends of the tray (that go through), to match the angle of the legs? I have thought about that, and I might do it. 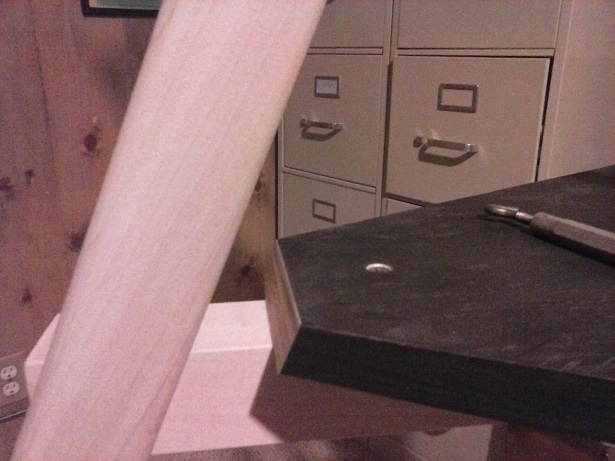 The edge of the plywood will get a thin piece of Poplar to keep things from rolling off. I'll do the same thing to the Poplar one. Edited by Garyth64, 28 June 2018 - 09:03 PM. I had some warped legs as well so I went with some black ash that I cut down over twenty five years ago. 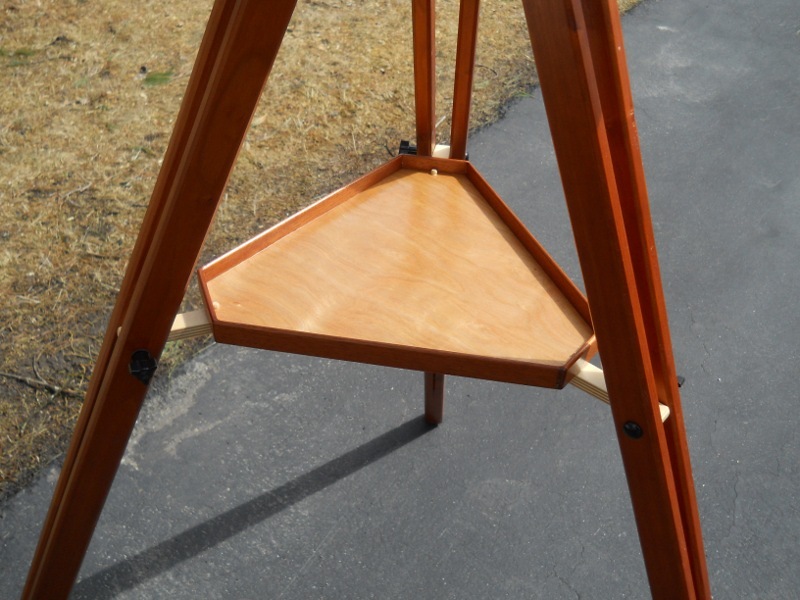 Here's a tray idea that I built for a friend, that allows a very sturdy tray and leg-brace, without any holes or fasteners added to a vintage tripod. A really sturdy tray is the easiest thing you can do to a floppy tripod to stiffen it up. Wow! That's a very cool idea. Rather than replacing the tripod on my 114, this would have solved the problem of having no spreader on the tripod. Looks very easy to take on and off. I may have to try one! Very nice. Ash is a very good wood for this sort of usage. I like those quick release clamps too - where did you source those Walter? That tray idea is really cool yes !!! 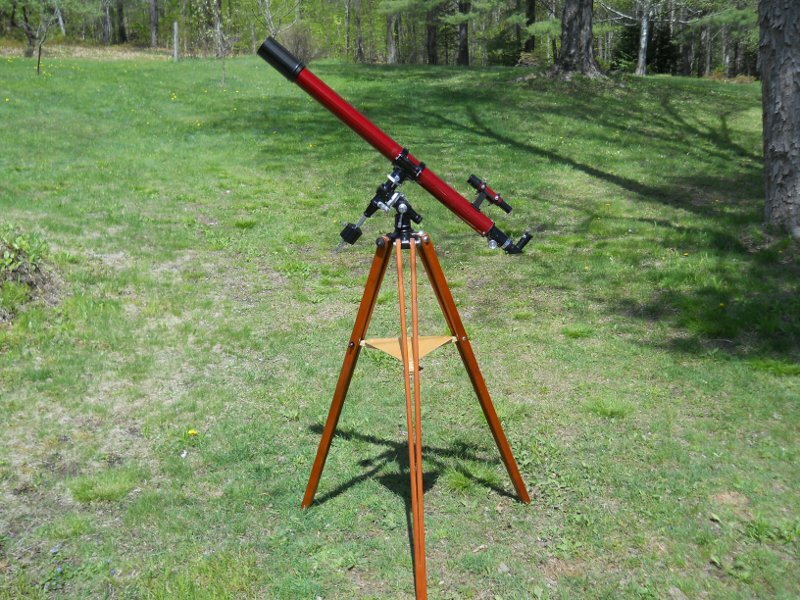 Actually on most common old scopes, I really dislike the trays they come with, with those spindly metal straps and tiny wing nuts and washers, that all want to disappear in the grass at night. And after a few uses everything is bent and rusty. 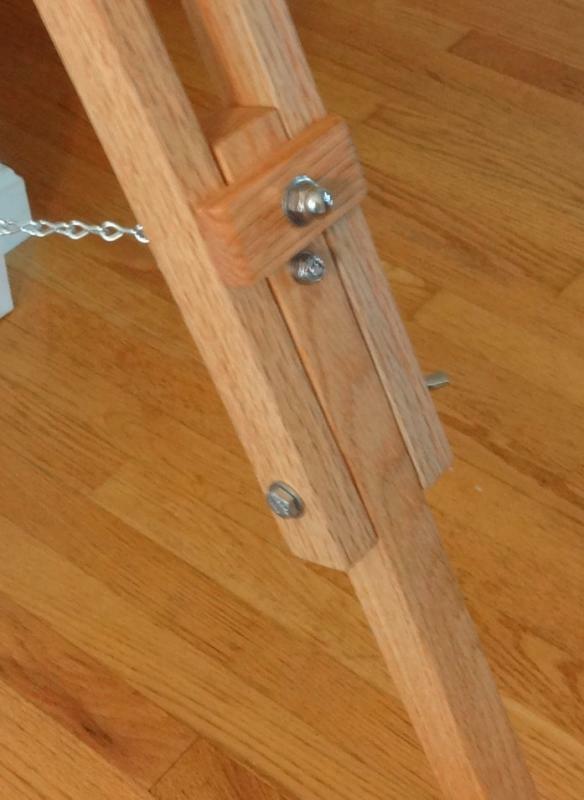 Here's an easy tripod to make, if a fixed-length one will work for you..... it's mostly just six sticks, pairs screwed together near the bottom, and spread to fit the mount hubs. A spreader-tray fits in between part-way up. The legs on this one are cherry, the tray is birch plywood. Edited by roscoe, 29 June 2018 - 06:32 PM. Wow . . . That’s nice!! Beautiful! That is a nice tripod, and I like those mounts. 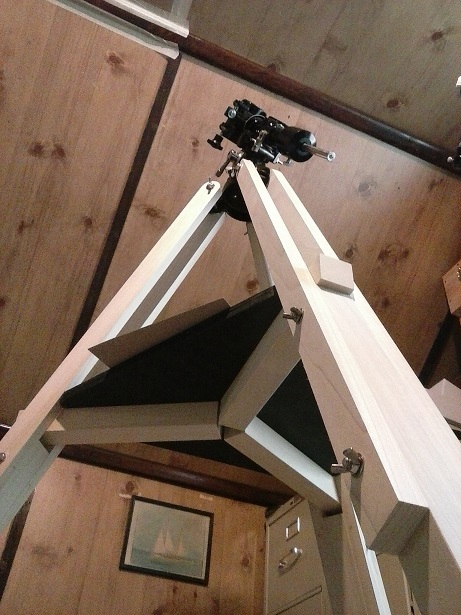 That style mount with a 7TE-2, is going on the new Poplar tripod for tomorrow's outreach. 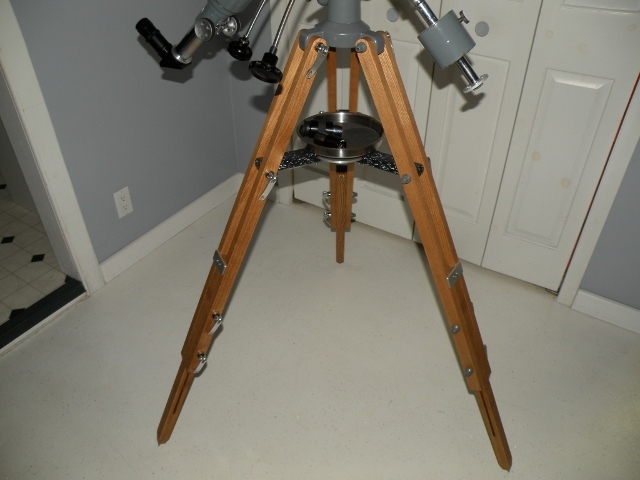 I will also have a Sears 6339a on the Birch tripod set up there too. The Poplar mount is done. I will take some pictures at our outreach program. Edited by Garyth64, 29 June 2018 - 07:07 PM. 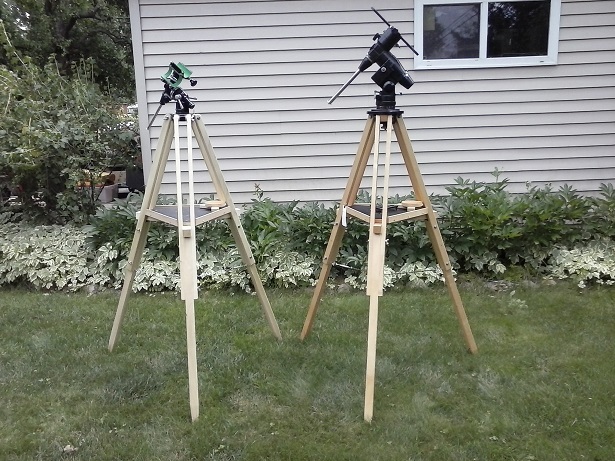 New Poplar tripod on the left, Maple tripod on the right. Edited by Garyth64, 30 June 2018 - 12:45 PM.